With the release of Captain Marvel just a little over a month away, Marvel Studios is making one last push before the press tour kick off. 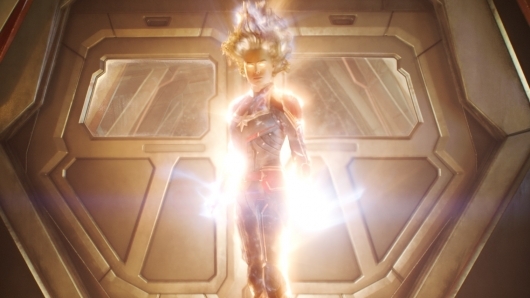 We’ve seen plenty of trailers showing Carol Danvers (Brie Larson) making one crashing return to Earth with new questions about her mysterious past. But as she begins to find the answers, an intergalactic war between two aliens races takes place with Earth being at the center of it all. Check out the latest look at Captain Marvel here below. While we’ve done plenty of trailer breakdowns in the past, there is still some new footage for Marvel fans to feast on here. Some of the new things that are worth pointing out is that we get our first look at Maria Rambeau (Lashana Lynch), who asks Carol if she is ready to show the boys how its done. To which Danvers replies, “Higher, Further, Faster, Baby.” We soon hear these words repeat themselves with each word said as Carol stands up from a fall, when surrounded by men, and as she is about to fight a Kree soldier. Soon these words are repeated once more before it all ends on Carol saying “try to keep up.” Which is a bit ironic since they are second to DC when it comes to releasing the first female superhero standalone film. But that is besides the point. I’m hoping that this film can continue Marvel Studios’ trend of delivering hit films. We will just have to wait and see. The film also stars Ben Mendelsohn, Gemma Chan, Rune Temte, Algenis Perez Soto, Mckenna Grace, and Annette Bening. Directed by Anna Boden and Ryan Fleck, using a script written by Boden and Fleck, with Geneva Robertson-Dworet and Jac Schaeffer also contributing to the screenplay, Captain Marvel opens in theaters March 8, 2019.